Here is a closer look at our saddlebags. All of our models are virtually the same; they only differ with dimensions due to the shape of each motorcycle. Some of our ABS racks have an aluminum brace for extra support, like the one pictured here on a KLR 650. At the front of this saddlebag, you may notice a loop sewn on to the pocket at the bottom. This is to help with slipping the pocket over the ABS rack during installation. The chrome turn-buckles mounted at the rear of the ABS rack are what secure the bag to the rack. These buckles are incredibly easy to use and cut down on the amount of time it takes to install and remove the saddlebags from the bike. No more worrying about straps coming loose. One of these turn-buckles is also located inside the side bags near the zipper for extra security. Notice the carbon fiber vinyl sewn into the inside of the top bag. Our saddlebags are reinforced with extra layers of vinyl to ensure the longevity of each saddlebag set we make is superior to others. Also seen in the photo is the inside pocket. It is a great place to keep smaller items that you may not want bouncing around. It zips up the width of the bag for easy access. The folded canvas around the inside sides is the excess that is not being used when the bag is not expanded. A snap hook, "dogsnap," is sewn in the back left corner for hooking keys or other items to. Here is an inside look at one of the side saddlebags. Like the photo above, there is another layer of vinyl sewn inside the bag. This extra vinyl helps keep sharp cornered items from breaking through the bag. It also helps keep the stitching from tearing out when heavy items have been hauled around over a long period of time. This additional layer of vinyl aids the water resistant marine canvas also with its effort to keep the inside of the bags dry. Overall, twice the layers improves the life of the saddlebags. We have used this marine canvas for multiple applications, including bags for snowmobiles. Even the extreme temperature changes and rigourous abuse of snowmobiling did not affect the quality of the material. So, die hards out there who ride in freezing temperatures can rely on these bags not succumbing to winter conditions. 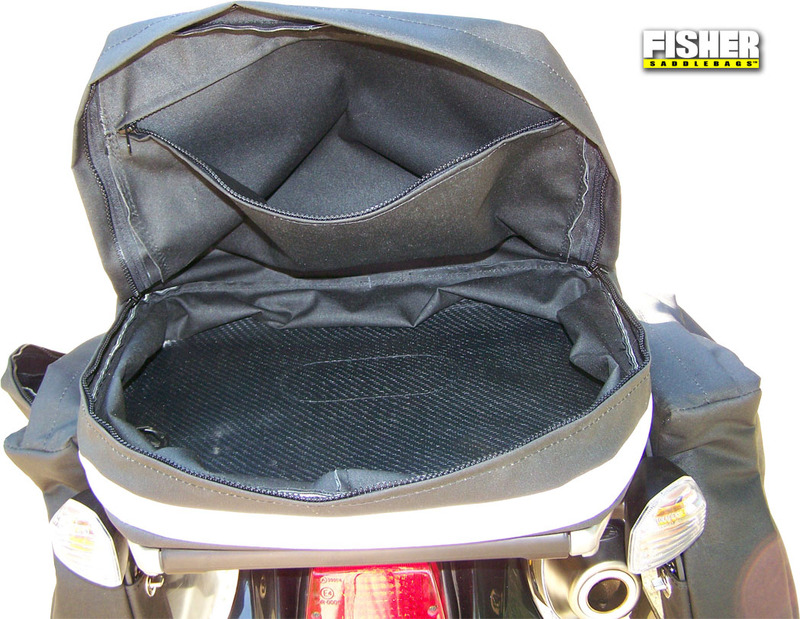 In order to make installing easier, Fisher Saddlebags™ have each of the side bags sewn to the top bag. This cuts down on the number of fastening devices needed to hold the bag to the rack. Thus, reducing the amount of time it takes to mount or remove the set of bags. Like most soft side saddlebags, Fisher Saddlebags™ also conform to larger items that are put in them. Items are not restricted to the 3 ½" width of the bag. Only the zipper closing will limit the amount of cargo the bags will carry. 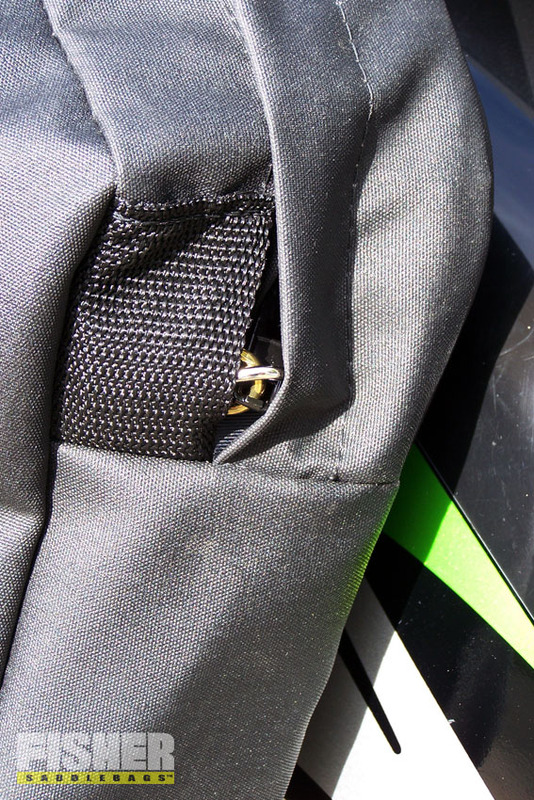 Even though our saddlebags are equipped with a superior molded tooth zipper, the most common zipper failure is a result of overpacking and forcing the zipper to close. The ABS racks can be used for more than holding the saddlebags to the subframe. Additional holes can be drilled in the plastic to hook bungees or mount additional hardware. This can be quite the advantage for bikes that do not have racks mounted to them already. more items on over the seat or saddlebags themselves. Our marine canvas is highly water resistant. The canvas is made with a protective coating that increases its resistance to moisture, yet remains breathable. want to clean them, we suggest only using soap and water. If you ride in the dirt or mud, chances are your bike and luggage are going to get filthy. We incorporate extra flaps over the zippers of each bag to avoid dirt contaminents and it also helps keep the inside of the bag clean from dirt and water. Post 2009 models: lockable luggage. To keep most spontaneous thieves out of your personal belongings, we have made the saddlebag zippers 'luggage lock' friendly. 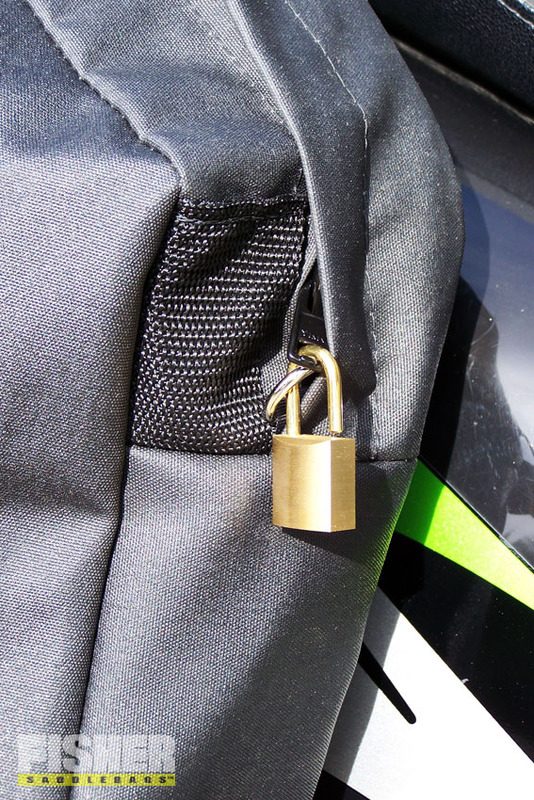 With the side bag zippers locked, the saddlebags can not be taken off of the rack. Which would also make it extremely difficult to remove the rack. Nylon webbing pockets have been added to support the locks when you choose to ride with them. This both helps prevent bag wear and zipper pull damage. The pockets also help keep dirt from jamming the locks.